With FAIRTIN, Stannol was the first solder manufacturer to develop a series of fair solder bars and solder wires for industrial production. Manufacturers can use these to make their products socially and environmentally more sustainable. Just contact us for more information! Until now there were only two important purchasing criteria for solder: QUALITY and PRICE. In many mining areas, there are disastrous working and living conditions due to the growing demand for raw materials. The environment also suffers greatly from the uncontrolled extraction of minerals. FAIRTIN goes much further than the current efforts of the industry to avoid the financing of armed conflicts in the Congo (see Dodd-Frank-Act, section 1502). 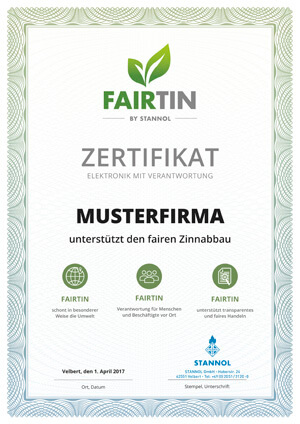 Tin for FAIRTIN comes only from suppliers who take care for the environment, respect national and international legislation and fulfill their social responsibilities. Currently, there is no tin mining that is certified as fair. With FAIRTIN you buy the fairest industrially available tin and help to drive the future development forward. Products from environmentally and socially sustainable sources Primary Tin from producers who are strongly committed to employees, society and the environment. We are happy to answer your questions about our new fair products.